Why and how did life become so diverse? This has been a central problem in biology. 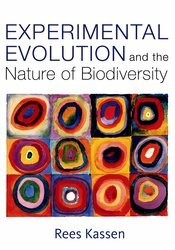 Experimental Evolution and the Nature of Biodiversity explores how diversity evolves in microbial populations that occupy some of the simplest environments imaginable, laboratory test tubes. Microbial evolution experiments allow researchers to watch the evolutionary process unfold in real time while tracking diversification in both phenotype and genotype along the way. When combined with new insights coming from next-generation sequencing, these experiments can tell us much more about the sorts of problems and questions related to adaptation and diversity.